New funding for energy efficiency improvements, workforce education, and carbon emission reduction projects is on its way to residents and businesses in the tri-county region. In December, San Luis Obispo county joined its counterparts in Santa Barbara and Ventura in an agreement to allow utility ratepayer fees earmarked for efficiency programs to stay within our region, instead of being pooled and redistributed statewide. This new program, known as 3C-REN, allows tri-county governments to collaborate and effectively operate programs that reflect our regional needs and allow for local innovation and autonomy. Outreach and opportunities are being identified now, with implementation beginning mid-2019. The first two program areas serve the building industry directly, including architects, engineers, builders, trades, and inspectors. The third program area serves residents through a direct install program, expanding to serve renters as well as home owners. We congratulate our county partners in establishing 3C-REN and look forward to engaging with the new programs and opportunities for energy efficiency on the Central Coast. Have good ideas for training or programs? Let us know and we’ll pass it along! Please join us in welcoming Mike Horgan to the In Balance Green Consulting team! Mike is a licensed builder in both California and Massachusetts, as well as a certified Passive House Consultant. No, we’re not launching a construction arm to our firm! Rather, we recognize the need to further bridge the gap between building science and in-the-field implementation, and we are thrilled to have Mike on board for that effort. Mike has worked in the construction field for more than 25 years having begun framing homes at the age of 17. For 13 years he owned and operated his own design-build firm on Cape Cod specializing in energy-efficient new construction and renovations, and he has many zero-energy builds to his name. He has built in numerous states in the U.S. and in three different countries. Mike specializes in bringing building practices, methods, and theories to real-life applications for architects, designers, and other builders. He focuses on life-cycle cost analysis of materials and applications; waterproofing, airtightness, vapor and insulation detailing; and the constructability of assemblies as cohesive packages. He is a graduate of Worcester University in MA with degrees in Economics and Finance, and Boston University with post-graduate degrees in Education and Linguistics. He is an active member of the San Luis Obispo Climate Coalition, within which he leads the Building Decarbonization team working towards carbon-neutral design and construction of businesses and homes. 1. Zero Net Energy Homes! Title 24 2019, which officially comes online Jan. 1, 2020 includes Zero Net Energy for new homes. The requirements for onsite renewable energy won’t cover all energy use, but it’s a major milestone in sustainable living. ZNE for non-residential is on target for 2030. 2. Local Climate Action! Engaged citizens, empowered city and county staff, and motivated elected officials are coming together to address climate action. To name a few: City of San Luis Obispo has set a goal of Carbon Neutral by 2035; SLO and Morro Bay joined Monterey Bay Community Power and will have carbon-free electricity starting in 2020; and the Sustainable Future resource is launching in Santa Barbara. 3. LEED Upgrades! Never an organization to rest on their laurels, the US Green Building Council is rolling out an update across all programs – LEED v4.1. And it’s better, addressing documentation issues, bridging market demand and recognizing new opportunities around the globe. They also added ZNE certification and a re-certification program for older LEED projects. 4. Healthy Interiors! Daylight, non-toxic materials, biophilic design, individual comfort, acoustics and more are all receiving the attention they deserve in our built environments. WELL and other programs merge building design, operations and behaviors for improved health and wellness. 5. Lower Carbon Emissions! 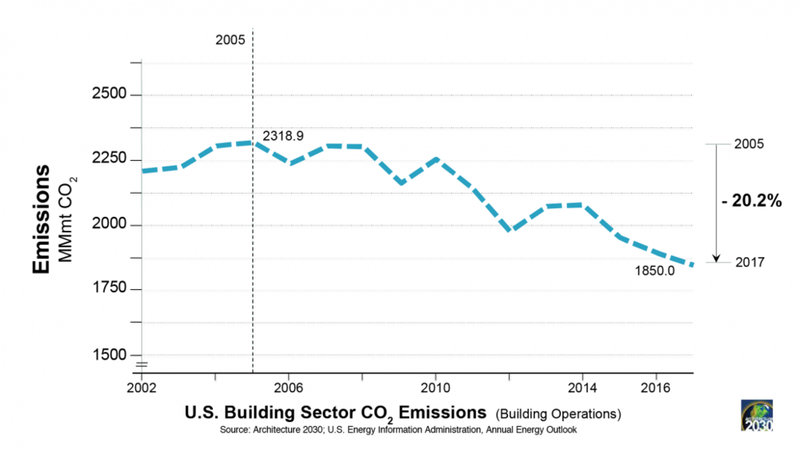 As reported by our friends at Architecture 2030, U.S. building sector CO2 emissions are 20.2% below 2005 levels. And that’s despite adding approximately 30 billion square feet to our building stock during the last 12 years! Now we’re picking up the pace from high-performance buildings to Zero Net Energy buildings to all-electric Zero Net Carbon buildings. Add to that list fabulous colleagues, clients and collaborators, our beautiful central coast, superb local food and wine and the joy of friends and family – no wonder we are feeling hopeful this New Year. Have a project you are excited to get started? Contact us to see how we can help! Congratulations to the Housing Authority of San Luis Obispo (HASLO) for their latest affordable housing project, which recently opened, just in time for the holidays! Iron Works, located on Broad Street, consists of 46 one-, two- and three-bedroom apartment flats, plus community rooms and support spaces. Developed by HASLO, the project effectively leveraged local funding and tax credits to maximize it’s ability to offer affordability and service. In Balance Green Consulting is proud to have joined the team, providing energy modeling, green consulting and TCAC services, in concert with Peggy Myrick of Integrated Commissioning and Energy and Paul Dunn of Central Coast Energy Consultants. The architect was Ten Over Studio. With the recent publication of several national and international reports on the alarming rate of climate change, the issue of atmospheric carbon, and what we can do about it, is on all our minds. According to data from the U.N. Environment Programme, the building sector is the single largest contributor to global warming, with building operations and the embodied carbon of building materials representing roughly 28% and 11% of annual global emissions respectively. Turning a ship that large is an enormous and complicated task to say the least. Are green certifications the best use of money, energy and time? How about policy advocacy? What tools are available to help optimize a design with carbon in mind? The Carbon Smart Building conference that recently convened in San Francisco focused on these questions and more. 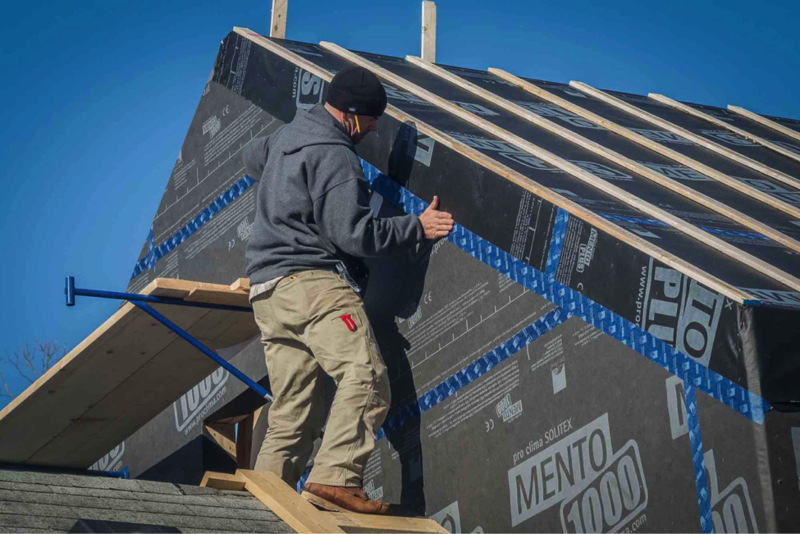 Using the framework of reducing the carbon emissions footprint (aka embodied carbon) of everything we build, sessions addressed Net Zero Carbon building, deep energy and carbon reduction retrofits, and Whole Building Life Cycle Assessment tools. · A summary table “Who’s Addressing Embodied Carbon” (about halfway through article). · A handy “mind map of embodied carbon” that attempts to capture the breadth of activities related to the topic. · An excellent guide on reducing embodied carbon for practitioners, with a focus on structural materials, assessment tools, and optimization strategies. One takeaway from the guide is that “structural systems are the most significant source of embodied carbon, but enclosures are also significant… [and] are under the architect’s control.” Building with wood usually has a lower impact than metal or concrete, for example, but it depends on the how the wood is forested. Also, metal and concrete can be manufactured in lower-impact ways, but you need to specify it. 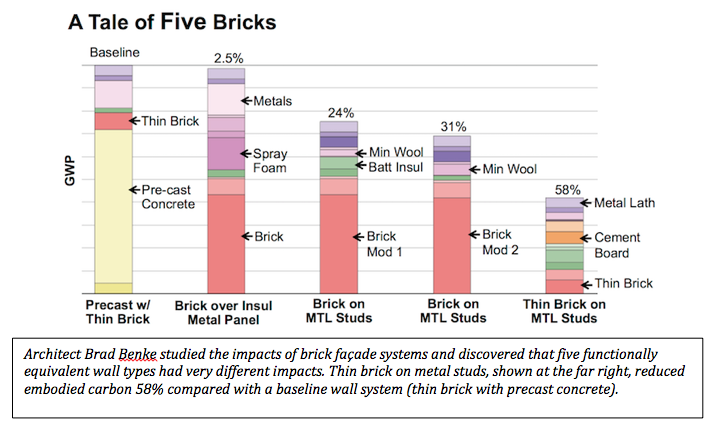 Running through a life-cycle assessment sometimes gives surprising results, as in this study conducted by LMN architects comparing 5 different ways to create a brick façade with varying impacts of Global Warming Potential (GWP). Also worthy of mention are several tools offered on the Architecture 2030 website including the Zero Tool, 2030 Palette education series and the Carbon Smart Materials Palette. Notably, in California the state government has given the zero carbon movement a major boost with the passage last year of AB 262, the “Buy Clean California Act”. The new law requires state agencies to consider the embedded carbon emissions of materials used in state-funded projects. Specifically, beginning in 2019, Buy Clean will require contractors who bid on state infrastructure projects to disclose the greenhouse gas emissions data for certain materials they use, such as steel and glass. Locally, the San Luis Obispo City Council set a target in September of carbon neutrality by 2035 for the entire city. Simultaneously, the Council voted to join a Community Choice Energy (CCE) program, which will provide an opportunity for more locally controlled and generated renewable energy and offer resources for energy programs and local contractors. Interested in looking at life-cycle analysis for your next project? Let us know! Sophisticated graywater recycling equipment has opened up possibilities for water re-use, but a $200 washing machine gadget may be your best investment for residential graywater. We recently had a client approach us about recycled water, understandably wanting to do their part to conserve this precious resource. They envisioned gathering sink and shower water and using it to flush toilets. While this is certainly doable, the number-crunching tells a different story that ends up saving money and effort. First, here is a re-cap on what is allowed in California: Graywater can be collected from laundry, showers and bathroom sinks. Kitchen sinks, dishwashers and toilets generate blackwater, which must go to the sewer or other treatment, but graywater can be collected for re-use. Untreated graywater must be used within 24 hours, or it becomes “blackwater”, so if it needs to be stored, it must be treated to a high level. Graywater used for landscape irrigation does not require treatment as long as it is distributed below the surface (e.g., underneath at least 2” of soil or mulch). Starting at a few thousand dollars, water treatment can make sense at the scale of a hotel or multi-family project, but for a single-family home, the appeal of using graywater directly becomes apparent based on the example calculations below. Toilets are so efficient now (as low as 0.8 gal/flush) that treating graywater for flushing just doesn’t pencil out. It’s also notable that even if you have lots of showers and laundry to generate graywater, you’ll still need to supplement your irrigation with potable water. · No building permit is required. For showers, you’ll likely need a surge tank and a pump, and a building permit is required. For L2L, efficient implementation requires advance planning because you either need the laundry machine to be on an outside wall or you need to plumb the waste line under the slab in the first place. L2L retrofits are pretty easy if the washer is on an outside wall or you have a raised foundation. The device is basically a 3-way valve that can divert graywater to the irrigation or be manually switched to the sewer, just in case you have a bleach load that you don’t want routed to your plants. To avoid clogging drip emitters, laundry water is usually targeted to trees or bushes. Materials are $150 - $300. Although L2L is pretty common now, we predict that re-use of shower water will be on the rise, along with new waterless technologies for toilets. As we move toward water conservation goals, we’ll be using every tool in the toolbox. Net zero water, anyone? Want more information? Checkout Greywater Action, https://greywateraction.org/ for more details and options, or send us an email to see how graywater could work for your project. California's New Target: Carbon-Free Electricity by 2045! California’s electricity grid is headed for zero emissions. In a ceremony on September 10, 2018, Governor Jerry Brown signed into law Senate Bill 100, setting a 100 percent clean electricity goal for the state by 2045. Brown simultaneously issued an executive order establishing a target for carbon neutrality statewide – also to be achieved by 2045. The state’s strategy is to continue reducing carbon pollution while increasing carbon sequestration in forests, soils and other natural landscapes. Improved air quality and public health outcomes are also to be incorporated into any new policies and programs. The new legislation preceded the Global Climate Action Summit last week in San Francisco, and comes on the heals of the state’s Fourth Climate Change Assessment (find Central Coast Section here). The report projects, among other things, an average annual maximum daily temperature increase of 5.6°- 8.8° by the year 2100. With increased temperatures and more extreme heat events, an increase in electricity use for cooling is expected. All the more reason to make that energy carbon-free. For more information on California’s efforts to reduce carbon emissions and boost the number of zero-emissions vehicles on the road, see the press release from the Global Climate Summit. Ready for your home or business to be carbon-free right now? Contact us to go ZNE! Plants are probably the most widely known strategy for bringing biophilic elements into a home or work space. But those palms, ferns, and rubber plants are busier than you think. In addition to being visually appealing, plants reduce stress, increase productivity and creativity, cool the space, and even remove toxins from the air. Did you know they can also help keep the peace? Not sure what to plant? Here are some top performers for removing indoor air toxins while improving acoustics at the same time. Interested in bringing biophilic design to your next project? Contact us!